Today is day three of the THANKSgiving Week Thoughts and it's all about giving thanks and filling myself with gratitude. Things were what I focused on yesterday and starting with all the little things we take for granted yet can be thankful for and create a flow of thankful thoughts. 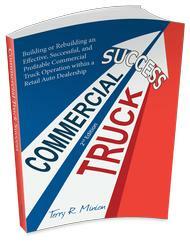 Running water from the sink faucet, hot showers, toilet paper, washing machines, rubber tires. Indeed, there are thousands of things that we can express our thankfulness for and that we are thankful for except that they blend in and we just don't see them anymore in that way. Renewing that relationship helps to prime the pump and get the juices of thankfulness moving. Writing them down helps. But, today, let's venture into the so-called 'harder' things to find thanks in. You know, the people who did you wrong, the job you hate, the politicians who don't care, your parents and how they never seemed to encourage you or fill in the blank. We all have had experiences, made decisions that we blame for some experiences we would rather forget. It's those things. It's not about forgiveness. It's not even about letting go. Although those things seem to help, for these stronger ones it takes more. It takes finding the good and then becoming grateful for them instead of wanting to forget them. I've dealt with a number of things from my past in this way. Enlightened philosophers and sages say there are no mistakes and that everything happens for a reason and everything is in perfect order. Trying to accept that premise just for a bit is helpful to find that silver lining in the midst of what we might have thought of as a tragedy, a mistake, something to forget. At first, it is very hard to find good in it, so a good question is, 'if there could be something good in this, what might it be?' We get so stuck sometimes with our limited perceptions. Shakespeare said it perfectly: "Tis nothing good or bad, but thinking makes it so." We just need a shift in perspective. I have become thankful for virtually every situation or circumstance in my life now by facing them and finding the good and becoming thankful for the situation. This includes deaths of loved ones, so-called serious judgment errors, thinking my parents were ill-prepared for child rearing and much more. It is all perfect now and there is no fault because there is now nothing but gratitude for what was. This Helps Live Today Free Of Baggage, Or At The Very Least, To Travel Much Lighter. Anchors Away! Spread Some Joy Today--Let joy be your compass today. Some things are really easy to be grateful for, and for many, they don't come along regularly enough to help them become a grateful person. And certainly, the things that so many can never be grateful for because they are mean, nasty, evil, wrong, along with a lot of other descriptions. So with these, gratitude, or being thankful is rare enough. Yesterday, I said that in day one that the message or recommendation is to make a decision to become a grateful, thankful person. Today is day two in the THANKSgiving Week Thoughts, and I will add what I think is the easiest and fastest way to open the floodgates to becoming a grateful person. My grandmother used to tuck us in at night and tell us to count our blessings. It didn't mean too much to me then, but it is one of my main joys today. I now do it so much in my head, but writing it down is so excellent. This morning, I took just fifteen minutes and filled two and a half pages on college ruled lined paper. There were things, people, and more. As I sat there thinking and looking around my office, I would find another and that would cause me to find another, then one would just pop in my head. If I would have kept going I might have filled a whole binder. This is a wonderful place to begin. Often we have hundreds of possessions and don't give them any thought or appreciation. Sometimes when I think of how thankful I am for something, I like to mention it to the appropriate party. I thought of my old stereo speakers that I was enjoying the sounds of this morning. They are Polk Audio 10 speakers, so I went on facebook, found their page and thanked them for these wonderful speakers that play as good as when they were new, yet I bought them in 1983. Look at all the enjoyment they have given me for so many years. Sometimes it is mundane, yet very important products that we use in the home that comes to my mind. Here's one: toilet paper. I am so thankful for that invention and the creative people always making it better. Facial tissues are like that too. Toothpaste, hair shampoo in just your favorite smell and shampoo excellence. I just have to think about the supermarket grocery store and I am in instant gratitude. This is a relatively recent invention where you can find almost anything to eat you could possibly want. How about double pane windows? They changed the environment in my home completely. My iPhone 5S. What a work of magic it is. Digital cameras, Memory cards, USB memory sticks, and more. The cloud. The Internet. My car. My truck. Music. Musicians. Electric guitars. Recorded music. Concerts. My HD TV and Blue Ray Player. As you make your own list and keep adding to it, gratitude just builds and builds and more things that you are thankful for will come to you to appreciate again. There Is Such A Wealth Of Things To Be Thankful For. Spread Some Joy Today--by seeing through eyes that find positive aspects in things and other people. As you acknowledge their existence, joy is a result. To so many, Thanksgiving is a time to get together with family, some of which we may only see once a year at events like this holiday. It's a time to share being grateful for one another, enjoy the fruits of our labors by creating a feast that is easily five times what we would normally cook for a meal. It is a day set apart for giving thanks. To others, it is a day of dread. They may not have family, or family that cares. They may be poor and have no feasting plans. They may be lost and feel alone. There are organizations and people who try to alleviate some of this like The Salvation Army, Local Shelters, Anthony Robbins Foundation, and many more with volunteers from all walks of life. To some, it is an obligation. It is an expectation. And that is often mixed in smaller and larger doses to the whole mix. I've always disliked the obligation aspect of this and so I focus on the word thanks. I do that because regardless of what our individual circumstances, there are things we can be thankful for, and even if we are not known as a grateful person, we might go along with the spirit of this holiday and express our thankfulness for any and all things we could find that we are or could be thankful for. So, for this 7-day period of Thanksgiving week beginning today, I will focus on finding ways, things, people, events, circumstances, and more to be thankful for. There are so many things that we simply take for granted that if we thought about them from a different perspective, we could find waves of gratitude. In recent years I have become such a grateful person and I see things, people, and circumstances every hour of every single day now that used to pass my glazed over eyes. Now I see them, and I think that this began with a desire to be a grateful person. I remember reading so clearly the first time in the Bible to "give thanks in all things." It didn't say some things, or once a year, but all things and that would be all the time. Day one of this week's THANKSgiving Week Thought message is just that: Choose to be a grateful person. Regardless of your religious beliefs, or even whether you have any at all, that Bible quote to give thanks in all things is as valid and effective and true. Decide today. Try it for just one week. I guarantee you will never go back. Spread Some Joy Today--by making a list of things you are grateful for. You will need a large binder. as if you just heard something brilliant." Just helping prepare a positive and upbeat flow of relationships for the upcoming annual feast of Thanksgiving. What a great place to start, regardless of the relationship. You'll Soon Enough See The Value Your Kindness. Spread Some Joy Today--What can you do to help prepare? That will spread some joy. Today marks the 1,878th post in this blog, just into its sixth year. In all this time, I've missed one day. It was the day my wife died. I chose to mark it that way. In all this time I have reposted approximately 5 or 6 posts, so pretty much, they are new every day. That's a lot of new every day, and it requires the 'c' word--commitment. I do my best to be inspired before I begin writing. It might come in a minute, or it might take hours, but eventually, I have to sit down and write or it will not get done. There are dry days and wet days. Some days it flows, and other days it might be a real challenge, yet via the idea of commitment, it always gets done. It might sometimes spill into the next morning, but it gets done. When I'm inspired, I feel brilliant. That doesn't necessarily mean that I am, but I feel that I am. Other times, I think it might be a poor effort, especially when I read it the following morning. And, that is so interesting to me when after one that I think I missed the quality mark on, I might get several people responding saying that this particular message was speaking volumes to them personally at the perfect time when they needed such inspiration. Often, I laugh at that to myself because I thought I missed it completely. Then there are times I feel brilliant and I get nothing. All this used to amaze me, but it doesn't anymore. I just show up, do my best to be inspired, give it my best shot at being brilliant, and let it sail away. That's all my part requires, and the rest is up to the reader. I share my thoughts, joy, love and how it is received is not in my realm of control. This applies to so many things in life where we don't really have control over the outcome, but we certainly do have control over the activity. If we put ourselves out there with a positive attitude, expressing ourselves as best we can under the circumstances and with what knowledge and skill we currently possess, that is totally our job in life. What comes of that is up to the rest of the universe. I Rest My Pen In Joy. Spread Some Joy Today--by being the best that you can be. There is no more. "So I'm curious, my fellow creators. at the heart of our experiments? What questions will be our oracles? to shower us with blessings. Then it came. I turned 30 and then 35 and then 40 and so on. Yet, as Satchel Paige said so well, "how old would you be if you didn't know how old you were? I'd be 35.
sometimes is just having your eyes open." I've probably taken at least 50,000 photos, but from a photographers point of view, I'm not one. That's why they separate amateurs from professionals. There is probably something more to it than that, but I don't really care. It's more about opportunities than skill much of the time to catch a glimpse of something special. In the last year or so, I've caught two that stand out to me. Just for the fun of it, I'll share them with you. 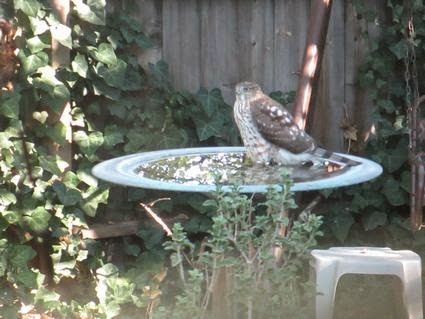 The photos of the hawk above are in the birdbath outside my office (which used to be a garage when the house was first built). I have a 7' sliding glass door to view the courtyard and get to see a lot of different birds drinking and taking a bath. Most of the time, they are common residents like Robins, Blue Jays, Finches and so on, with periodic visitors like Cedar Waxwings. But, never a hawk. 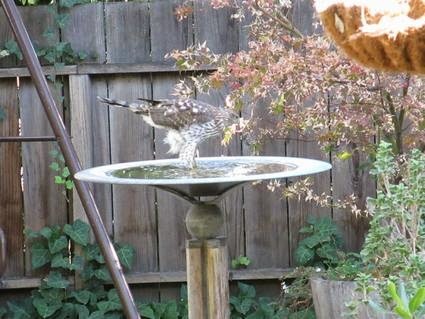 In fact, in 29 years here, I've only ever seen one overhead, but never in the yard, and especially not in the birdbath that is way too shallow for such a big bird. Then, yesterday on the 5th of November, 2014, I was talking with my business partner on the phone and I looked out at the courtyard and there was this hawk sitting in the water. He or she sat there for the longest time allowing me to use two different cameras and even shoot some video. Finally it took a bath went up into the nearby tree and preened a bit and was on its way. 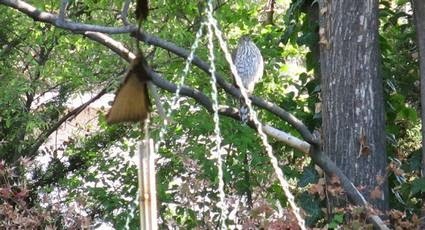 According to my bird book, this was an immature Cooper's Hawk. At first I thought it was an American Kestrel. What a beautiful and at the same time, serious-looking bird. The squirrel. This was also strange. Nancy bought this yellow squirrel solar night light. It would light up at night which looked odd. We had it for several years. Never saw a squirrel in our yard, and then one day we saw one eating some of the bird seed. We put out some peanuts and other nuts and it came around more. Then months later, there were two. 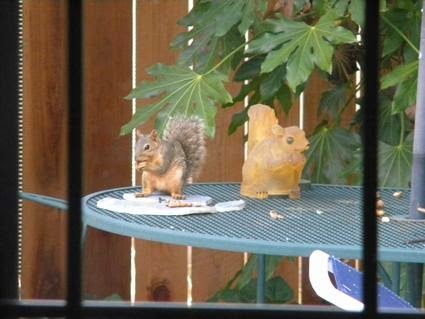 We would put nuts on the deck table and the squirrel would get up there and eat them or run off with them. One day I decided to put the solar squirrel on the table in hopes that I might have the unique opportunity to catch them side by side. It came to pass. I didn't have much time, but got some quick shots and this is the best of the lot where they are sitting at opposite angles, eating in the same way. I couldn't believe my luck, but I know it isn't luck at all. Be careful what you intend (we used to say 'wish for'), as it may very well come true! When You Delight In What You See And Experience, More To See And Experience Will Be Along Soon. Spread Some Joy Today--by choosing to make it a perfect day. No matter the weather, no matter the circumstance, no matter what. No one can choose except you. Truth is a universal idea, but it is only universal in that it may be one truth here, another there, another there, and so on. There is no such thing as The Truth. What truth really comes down to is a belief. If you believe it, then it is true for you, regardless if others agree with you or not. I attended a professional panel for a group of youth aging from 15 to 17 and one of the 17-year-old girls said that she put in 23 applications and did not get one call and how hard it was to find a job. As she said that, I was looking quickly around the room and a lot of heads were nodding in agreement--even some of the professionals on the panel. Later we had breakout sessions and when this girl came to my table, I mentioned to her that it was only hard for her to find a job because she believed that to be true. I know this because I believe that it is easy. I have the feeling based on hearing a lot of opinions that a majority lives in the truth that it is hard, that the pie is only so big and there is only so much to go around, and so on. Yet, a majority doesn't create The Truth, they can only create their truth. We get to choose our own truth, and in the end, that is the only one that matters. Limiting beliefs can feel very cozy and comfortable, and they can often find agreement with others to help us strengthen our position of outside limitations as being the norm. We can also decide to change those limiting thoughts and beliefs and cross the Pyrenees to the other side at any time. Maybe It's Time To Let Go Of Some Of Those Limitations. Spread Some Joy Today--by choosing to see the unlimited beauty all around you no matter where you happen to be. Does it matter how far the past is past? Does it matter more if it was yesterday than a year ago? Does a year ago matter more than 10 years ago? It seems that if I'm relenting at all about the past, that it is what I intended to do and did not do, which is most often yesterday. Sometimes, I might relent a bit further back, and I guess it is only because the memory is fresh. Then today it occurred to me that it really doesn't matter at all whether it was an hour ago, yesterday, this week, last month, or 25 years ago. It is done. It was experienced at the time and what happened did happen and I cannot go back and do anything at all about it. It is past. However, I can and do have total control over this moment, right here and right now. I can change course, change my mind, change my thoughts, change my residence, change my job, change anything--but only right here and right now. If loving ourselves and then others is the ideal, and I believe that it is, loving ourselves begins with acceptance of ourselves, and that means everything we have done, will do, and what we are and what we will become. To mourn over the past is to negate the moment we have. The best way we can serve the past is by living in this moment. The 'if only' of regret is an impossible accomplishment. Imagine that what you did or didn't do yesterday that you are feeling regret about was turned into a block of metal and then put on a skid with a rope, and now today, you pick up that rope and drag that skid wherever you go today. Think how tired that makes you, and how it slows you down, how it gets in the way of everything you are trying to do today. The more regret you feel, the heavier that skid becomes. It's torture, and it is exactly what many people go through in the 'if only' world. Now imagine that you love yourself and accept full responsibility for all of your thoughts and actions right here and right now. You let go of the rope attached to the 'if only' skid and walk freely, act more positively, and feel joy in the present as you do whatever you choose, change whatever you feel needs changing, relaxing in the glow of the moment. Ahhhhhhhh. That's What I'm Talkin' About! Peace Of Mind. Sing It With Me. . . Pe-e-e-eace, Peace Of Mind, Pe-e-e-eace, Peace Of Mind. . . Spread Some Joy Today--by just letting go of this rope and that rope and all those tangled ropes you've got going on. Once you are freed, you will soar.